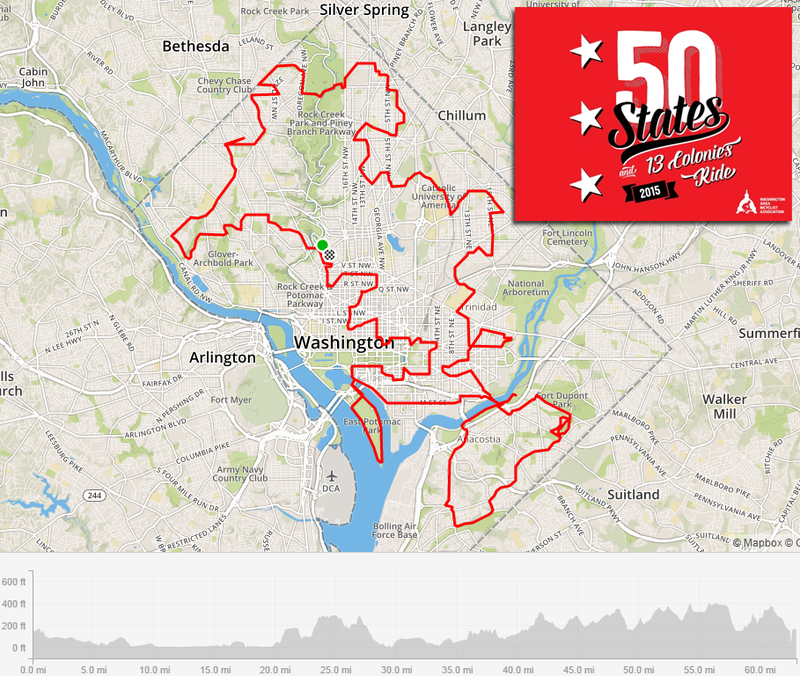 If the Washington Area Bicyclist Association has a signature ride, it has to be the 50 States (and 13 Colonies) ride. Seven years ago I did the full ride for the first time. It is a 62 mile winding route that goes on every street named for each of the 50 states here in the United States. It has changed a bit since the first time I did the route. It is a ride that really shows you the distinct parts of the district that many never get to see. The the full route has a cue sheet eight pages in length with well over 100 turns. The first few miles lull you into a false sense of ease as you traverse the monumental core from your starting point in Adams Morgan. After you cross the Anacostia river, you are quickly taken out of that sense of ease as you climb and descend the terrain of DC many times. The first year I did the route the weather cooperated, however, in recent years the ride has gotten a reputation for being a harbinger of miserable weather. This year lived up to that reputation As if on cue, rain began falling right as the mass of cyclists made their way from Walter Pierce Park. The sight of so many cyclists filling the streets of DC was definitely something to behold. The ride sold out very quickly after being opened up to WABA members. The mood was festive and upbeat and everyone seemed to expect the sogginess. I started out the ride with Friday Coffee Club regular Bob and we rode together in the dense mass of cyclists. With all the zig-zagging on city streets, the mass of cyclists started to stretch out due to lights and traffic. By the time we got to Hains Ponit there was a group getting out of the 3 mile loop, and when we got out of the loop there was another group just entering. So 10 miles in, there was at least a 6 mile spread. After Hains Point the route made a bee-line to the Anacostia river where we crossed over the Pennsylvania Avenue bridge, went down the bumpy path to Anacostia Park, and arrived at the first pit stop. I stopped to water up, ate another half banana, and then was on my way to the first of the climbs that would consume the rest of the ride. Once you leave Anacostia Park there is a long climb up Martin Luther King to Malcolm X and then some more climbing for good measure up Stanton and Alabama. It was somewhere in Anacostia that I ran over some rebar (or so I&apos;m told, I didn&apos;t see it, I just heard it). Everything appeared to be fine, but when I got home that night I would see that the sidewall of my tire had been damaged, causing brake rub on the sidewall. Thankfully, it would not put a wrench in my ride. After a quick descent from the heights of Anacostia on Pennsylvania, we made a climb back up to Fort Davis, and then enjoyed a long and glorious descent down Massachusetts. After some zig-zagging we crossed the Anacostia river and headed over to our lunch pit stop at Eastern Market where a break in the rain was our reward for our work. This year lunch was provided by District Taco (if you paid the extra $10, which I did) in the form of a burrito and chips. I made quick work of the burrito and talked briefly with Boomer who was marshaling the ride and then got back on my bike and headed back to conquer the remaining states. The relative flat of Eastern Market gave way to the steep (over 10% grade at times) but brief climb of Mt. Olivet that the cue sheet mentioned you might want to walk up -- I spun up to the top and then continued to climb to Petworth and then to Takoma. On the way to Takoma the rain reasserted itself with a vengeance. By the time we got to the pit stop there the rain was nothing short of torrential. One of the volunteers advised us to make a detour on the next leg of the route as 36th street had been flooded. I topped off my water bottle, had a gatorade, and used the tent&apos;s shelter to change the page on the cue sheet with a minimum of water damage, and I was off to enjoy the free shower and bike wash. Our route took us down into Rock Creek Park and into some beautiful neighborhoods that many people don&apos;t even know exist. Then we skirted the Maryland line for a while before looping down a bit before climbing back up to Tenleytown for our final pit stop. At the Tenleytown pit stop there was free coffee, which as delicious as it appeared to be, I wasn&apos;t in the mood to drink. There was plenty of water which I happily consumed. The rain had given up at this point and I enjoyed chatting with the volunteers and thanking them for making the event possible. At this point we were 8 miles from the finish, but I knew what was ahead from my previous time on the ride. This was no time to celebrate, it was time to prepare. Essentially, to get Arizona Avenue in, we were about to go from one of the highest points in the district to a stone&apos;s throw from the the lowest. Then we would be climbing back up on hills steep enough to have houses on terraces. After nearly 60 miles it certainly lets you know you&apos;re alive. I remember doing the same climbs on a slightly different route in 2008 and finishing, but feeling exhausted afterward. It was a slow and solo affair. This year I felt strong, really strong. I was able to hang with a group of obviously experienced riders, and at the finish of the climbs I was actually leading for a bit. As the end was nearing I felt good, which was fortuitous, since after the celebration at the finish I had another 20 miles to go home. The celebration was at one of my favorite pizza places, the Mellow Mushroom. 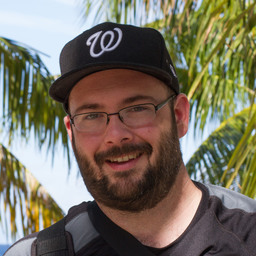 Oddly enough, it was my first time visiting the DC location. Upon arrival I was issued the requisite t-shirt and a coupon for a free beer. The beer was delicious and soon gone. I got my favorite Mellow Mushroom pizza and had a few more celebratory beers while chatting with friends old and new before heading home on the bike. By the time I rolled into the driveway I had biked about 82 miles for the day. Even though the conditions were less than ideal, I am glad I did the ride again this year. It showed me how far I&apos;ve come over the last few years in my biking ability. I went from struggling to finish to finishing with the pack and adding on extra miles to ride home. With the prior week&apos;s century and commuting miles I rode nearly 400 miles in a fortnight while completing the first and third longest mileage days I&apos;ve ever done in the same period. I have another big ride scheduled this year that I&apos;ll be riding with my friend Reba and I can&apos;t wait.